This week I feel like I’m standing on a personal threshold – week 2 of my hubby’s post-hip surgery is a new page. He’s moving around very well, the incision is healing well, and he’s actually enjoying the use of his now pain-free hip joint. The surgery on the other hip doesn’t seem so intimidating now, and I can envision a day in a few months when he’ll be able to walk around with me once more as we adventure across the world. There may be a lot of problems to deal with in our modern society, but we are truly blessed in the medical field; just a few decades ago my hubby would have spent the rest of his life in a wheelchair instead of being able to walk around almost normally just a couple of weeks after having an artificial hip take over the duties. To anyone who’s going to have the surgery done, and to their loved ones, just hang in there – recovery proceeds amazingly quickly. 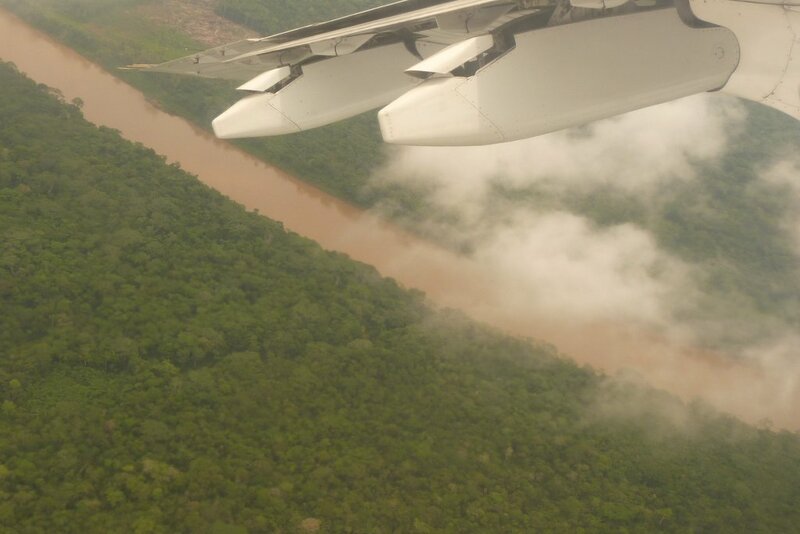 My response to the photo challenge, though, is a picture that has many threshold meanings for me: we’re coming in for a landing in the Amazon Jungle, watching muddy brown tributaries of one of the greatest water systems in the world snake through lush green foliage, about to adventure into the deep dark jungles of South America. As we approached the airport in Puerto Maldonado, though, we could also see with our own eyes areas denuded of foliage, razed by clear-cutting. The average person might think, ‘So what, it will grow back’, but in the jungle things don’t grow back. The soil quality, ironically, is very poor, and is supported entirely by the decay of the vegetation and animal droppings. Once an area is clear-cut, it never recovers. Arctic ice is melting at an alarming rate, to the point where polar bears are drowning because they can’t find ice floes close enough to swim to before they die of exhaustion. Arctic warming had a profound effect on this past winter in North America, forcing a polar vortex to remain in place over much of the continent for months. Antarctic ice has been receding and breaking up for the past decade. Clouds of dust from the Sahara are creating health issues in the UK. Rapacious palm oil companies are destroying our rainforests, the lungs of our planet and the home of hundreds of animal species. Not content with destroying the surface of our planet, industrialists are now digging the planet out from under us with new technology far more invasive than even traditional mining. The list is long. 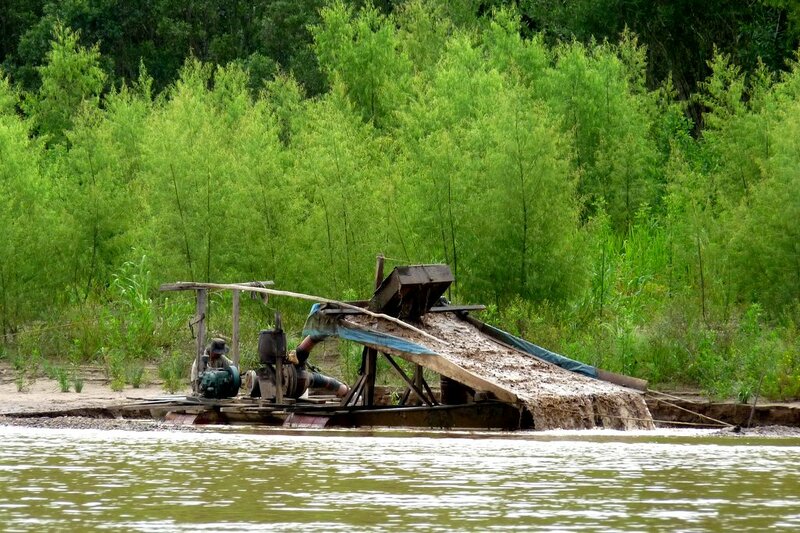 As we boarded our motorized canoe at Puerto Maldonado and zipped up the Madre de Dios River to get to our lodge deep in the Tambopata Reserve, we passed several gold-mining barges. 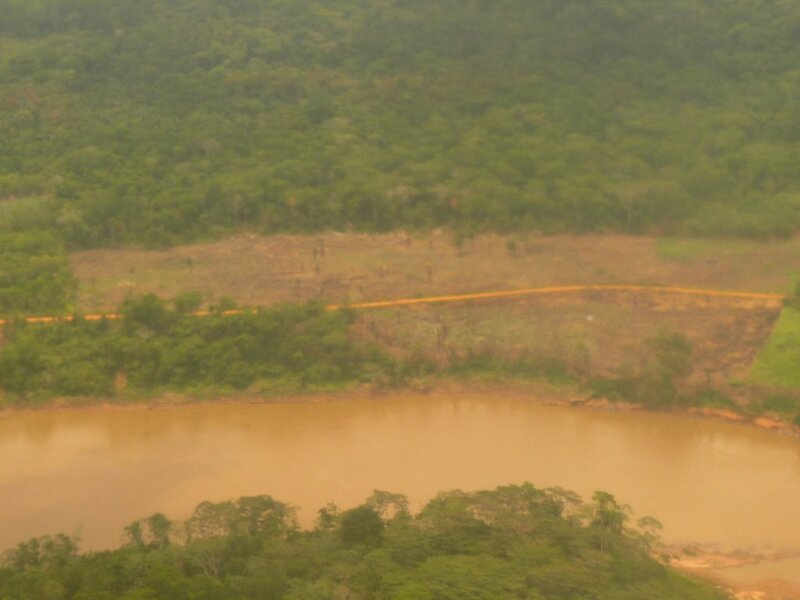 Amazon gold mining is incredibly destructive to the rainforest habitat and environment. The television program you may be enjoying on the History Channel is actually a heartbreaking showcase of man ravaging our planet. We spent two glorious days in the Amazon rainforest, enjoying the rich diversity and beauty of a resource that may not be around in our children’s generation. If you have any desire to see it, go now, while you still can. Our planet exists as a single interconnected ecosystem, like our own bodies – a failure of one organ will have a cascade effect that threatens all the rest. The Amazon basin covers 2.1 million square miles, roughly two-thirds the size of the Sahara, which was itself once a forested area. 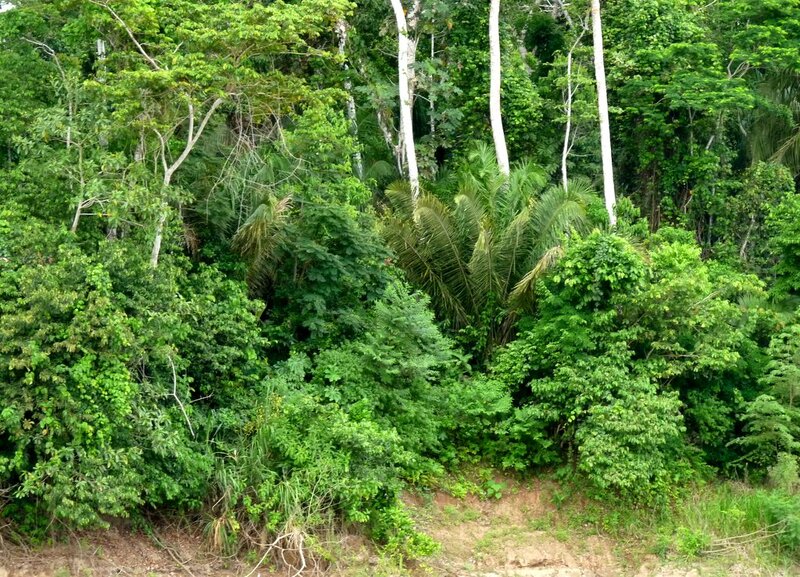 What do you think will happen when the Amazon, the largest green lung and most diverse animal habitat on our planet, disappears? We are on the threshold of complete disaster. Everyone needs to become proactive now to, quite literally, save our planet. Educate yourself about what’s happening, sign petitions, stop using products that are harmfully harvested or grown…if we don’t, our planet will likely be uninhabitable in less than 100 years. The BBC website is a great place to start learning more. Thank you for the link. I see that your corporate website has a page set up for sustainable practices but no info posted yet – I’d be interested in finding out more.